letter of credit enhanced and private placement of tax-exempt and taxable bond financings. Represented a large social service not-for-profit corporation in connection with refinancing existing debt and financing renovations to multiple condominium units, which was financed through a private placement of $10 million in tax-exempt and taxable bonds issued by Build NYC Resource Corporation. Represented several not-for-profit corporations in connection with the redemption and defeasance of tax exempt bonds issued by New York City Industrial Development Agency. Represented a prestigious New York City private school in connection with a construction loan and various lines of credit. Represented a prestigious New York City private school in connection with a private placement of $85 million in tax-exempt bonds issued by Build NYC Resource Corporation. Represented a prestigious New York City private school in connection with its tax-exempt loan through a refunding note made available by Build NYC Resource Corporation, the proceeds of which were provided to it by a leading bank and used by the school to defease existing tax-exempt debt. The representation also included a non-revolving line of credit provided by the bank. Represented a large social service not-for-profit corporation in connection with its acquisition of a 44,000 square foot commercial condominium unit, which was financed through a private placement of $30 million in tax-exempt and taxable bonds issued by Build NYC Resource Corporation. Represented a not-for-profit corporation focused on serving LGBT senior citizens in connection with its acquisition of a commercial condominium unit, which was financed through a private placement of approximately $7.9 million in tax-exempt bonds issued by Build NYC Resource Corporation. Represented a New York City educational and cultural not-for-profit corporation in connection with a $16 million securitized loan from a major conduit lender, the proceeds of which were used for working capital purposes and to refinance tax-exempt bonds and other commercial debt. Represented a not-for-profit corporation in connection with the sale of its office building in New York City to a prominent developer. Represented a financial institution in its direct purchase of $26.7 million tax-exempt and taxable bonds issued by Build NYC Resource Corporation for the benefit of a leading private school in Brooklyn. The proceeds of the bonds were used to refinance existing debt. Represented a nationally-recognized bank in connection with a private placement of $15.2 million in tax-exempt bonds issued by Build NYC Resource Corporation. Represented a nationally-recognized bank in connection with its private placement of $7.5 million of Build NYC Resource Corporation tax-exempt bonds used to refinance a private school's existing tax-exempt debt and provide a working capital line of credit. Our representation included the negotiation of several intercreditor agreements among the various parties including the bank as swap provider and line of credit provider. Represented a nationally recognized bank in its issuance of a $5 million line of credit and direct purchase of $5.4 million tax-exempt and taxable bonds issued by Build NYC Resource Corporation, each for the benefit of a large social service agency, which bonds and line of credit were secured by pledges from 5 affiliates and the borrower. Represented 3 financial institutions in 6 separate private placements of an aggregate $11 million tax-exempt and taxable bonds issued by the Nassau County Local Economic Assistance Corporation and the Suffolk County Economic Development Corporation for the benefit of 5 participating member agencies of the Alliance of Long Island Agencies, Inc. for Persons with Developmental Disabilities. Represented a nationally-recognized bank, as lead bond purchaser, in its direct purchase of $50 million of $96 million of tax-exempt bonds issued by an out of state issuer, the proceeds of which were used to refinance existing tax-exempt debt and finance through a draw down structure the construction and renovation of several healthcare facilities. Represented a financial institution in its $2.2 million term loan to a New York college and its direct purchase of $8 million of tax-exempt and taxable Sullivan County Funding Corporation bonds issued for the benefit of a local dormitory corporation. The proceeds of the loan and bonds were used to refinance existing debt. Represented a nationally-recognized bank and locally-recognized bank in their roles as bond purchasers of 4 separate series of tax-exempt and taxable bonds totaling $17 million issued by both the Suffolk County Economic Development Corporation and the Town of Brookhaven Local Development Corporation, which were secured in part by mortgages on over twenty properties. Represented a nationally-recognized bank in connection with the financing of the rehabilitation of 8 affordable housing properties with 9% tax credits, bank construction loan and various HPD funds. Representation of a nationally-recognized bank in connection with its private placement of $44,000,000 tax-exempt bonds issued by the City of Yonkers Industrial Development Agency, which proceeds were originally utilized to develop a multifamily residential high rise and which private placement was secured by a mortgage and a guaranty issued by a prominent real estate family. Represented a nationally-recognized bank in connection with a line of credit to a large New York housing community lender. Represented a nationally-recognized bank in its multi-faceted financing role for Teachers Village (Newark, NJ), a complex, qualified school construction bonds and new markets tax credit transaction, including representing the bank as bond purchaser, bridge lender, escrow agent and administrative agent. Represented a nationally recognized bank in its $9.4 million construction loan to an SPE controlled by a New Jersey not-for-profit developer, the proceeds of which, together with proceeds from 3 different NJHMFA funding sources, FHLB funds, Township of Tom's River Affordable Housing Program funds and Borrower's equity funds, will be used to acquire and construct a 72-unit affordable housing development in Toms River, NJ. Represented a financial institution, as substitute letter of credit provider, in connection with tax-exempt bonds issued by the County of Westchester Industrial Development Agency to a skilled nursing facility. Represented a nationally-recognized bank as senior construction lender in connection with the development of supportive housing for the homeless with a preference for veterans on a decommissioned U.S. Army base. Represented a nationally-recognized bank in connection with its issuance of a $50 million standby letter of credit to another financial institution to support tax-exempt housing bonds issued through the New York State Housing Finance Agency's 80/20 Program, which were used to partially finance the construction of a large mixed use project in New York City. Represented the administrative agent in the syndication of approximately $24 million acquisition loan, the proceeds of which were used to acquire the real estate of a New York nursing home. Represented a New York commercial bank in the refinancing of nursing home debt. Represented the administrative agent in the syndication of acquisition, building and project loans totaling approximately $95 million, the proceeds of which were used to acquire a New York nursing home operation and real property. Transaction involved complex intercreditor arrangement with mezzanine lender and revolving lender. Represented the administrative agent in the syndication of acquisition, building and project loans totaling approximately $75 million, the proceeds of which were used to acquire New York nursing home real property. Represented subordinate lender in financing the acquisition of multiple nursing homes. Represented a nationally-recognized bank as senior lender in connection with a $24 million refinancing of a première hotel, which included a $7 million mezzanine loan made by another lender, and involved negotiations between the lenders with respect to intercreditor rights and with a third party property manager with respect to operations. Represented a nationally recognized bank in its participation in a $67.9 million loan for the acquisition, formation and renovation of a commercial condominium shopping plaza in Throggs Neck. Represented a nationally recognized bank in its capacity as a lender and administrative agent for a construction loan in the aggregate amount of $51 million to a SPE controlled by a global asset management company and a real estate developer. The proceeds of the construction loan, together with the borrower's equity, will be used to acquire and construct a 57-unit commercial and residential condominium in New York City. Represented a nationally recognized bank in its capacity as a lender and administrative agent for a construction loan in the aggregate amount of $80.6 million to a SPE controlled by the project's developers. The proceeds of the construction loan, together with the borrower's equity, will be used to acquire and construct an 18-story, 25-unit commercial and residential condominium in New York City. Recognized by Crain's New York Business in its review of 2019 Notable Women in Law (January 2019). 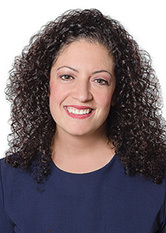 Ms. Arbeeny is a graduate of Boston University and earned her juris doctorate from Brooklyn Law School. While attending Brooklyn Law School, Ms. Arbeeny was a member of the Moot Court Honor Society.